José Martínez tallied four hits against the Dodgers, including an RBI double. 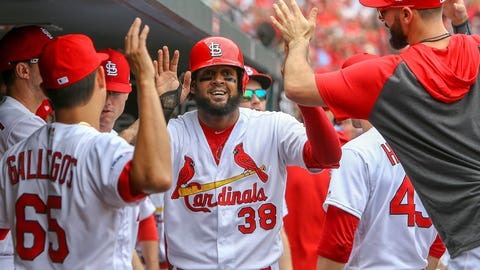 Wieters drove in three runs and stole a base for just the third time in six years, leading the St. Louis Cardinals over the Los Angeles Dodgers 11-7 Thursday for a four-game sweep of the NL champions. Making his first start this season, the 32-year-old Wieters hit a sacrifice fly in the second inning and a two-run single in the fifth that put the Cardinals ahead 8-7. With runners at the corners in the fifth, Wieters stole second as Matt Carpenter struck out, his first steal since April 27, 2017, and just the ninth of his major league career. He was part of a rare two-run wild pitch in the second inning by Walker Buehler. When the ball bounced toward the first base dugout and first baseman David Freese let catcher Rocky Gale chase after it, Jedd Gyorko scored from third and Bader from second. José Martínez matched a career high with four hits, including an RBI double off Yimi García in a two-run sixth. St. Louis set a season high for runs and swept the Dodgers in a four-game series for the first time since July 15-18, 2010.